This fitout original began as a spec fitout for building owners, with a design that intensely focused on the front of house reception finishes, boardroom finishes and kitchen breakout to help draw attention to the space. New carpet laid throughout, feature timber posts, polished concrete, pendant lights and high end furniture pieces helped to draw the space together. Upon engagement the space was leased, and additional items were added to tailor the spec fitout to the client’s individual requirements. 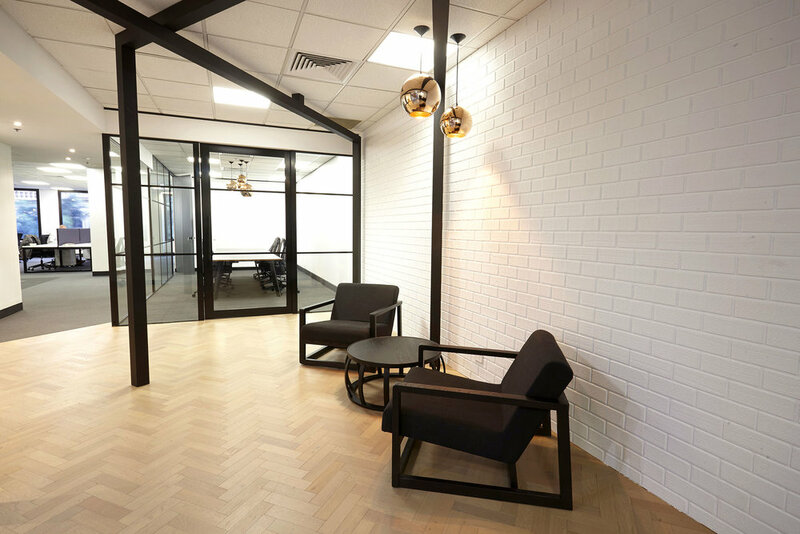 Additional offices, herringbone timber flooring in reception, additional open meeting space and more feature timber posts near the kitchen breakout. The works were completed on site in 5 weeks. © Nickaz Constructions Pty Ltd.